What? It’s Friday you say?! That's great news! And with the weekend comes a whole host of fantastic new tracks and albums. 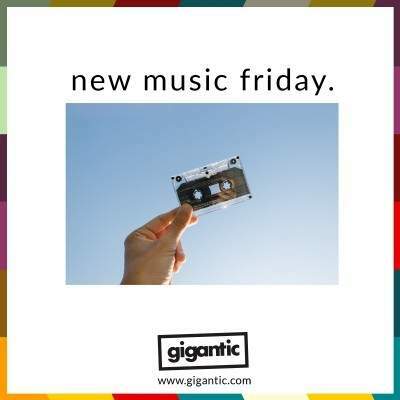 Gigantic is ready with the #NewMusicFriday playlist, your essential soundtrack taking you through the weekend with all the most exciting newly released music. And that's not all, we take a closer look at the truly awesome acts plus offer you tickets to see them play live. Keep scrolling to have a read! The band’s passion for music sees them combine such varied influences as hard rock, R&B, indie and even pop across four tracks which sees them bare their soul on this impressive EP. We expect that the songs from ‘What Did You Think When You Made Me This Way?’ will be performed live at their upcoming gigs at Cardiff, London and Birmingham next month. Nothing But Thieves tickets are currently available. "Spawned from some hotel room writing sessions last year, Vector's album closer was a fresh approach to concise song writing, for which we are not typically known. While the lyrics in A Cell Divides unlock more clues to the narrative of Vector, the video, filmed mostly in slow motion, contradicts the frantic pace of the song and delves into the beauty of flawed and warped imagery." HAKEN tickets are currently available. Cloud Nothings tickets are currently available. Formed in 2012 and coming out of Michigan, the rockers draw influences heavily from the sound of the 70’s and take the likes of Led Zepplin and The Kinks as their role models which has earned them some serious fans, including Elton John who is said to have declared them the best rock band he’s heard in quarter of a century. Their unabashed love of all things Zep shines through on their debut album ‘Anthem Of The Peaceful Army’ as they bring the big riffs and raw throated cries to songs that explore the psychedelic wilderness. Greta Van Fleet tickets are currently available. Swedish singer Neneh Cherry is one of the undisputed leading voices in trip hop and one of the pioneers of the movement. Her latest release is fifth studio album ‘Broken Politics’ which saw her reunite for production with Four Tet to record her rebuttal to a world which sees a demagogue like Trump in the Whitehouse at the Creative Music Studio in Woodstock, New York. ‘Broken Politics’ features the singles ‘Kong’ and ‘Shot Gun Shack’ and is a record which sees Cherry explore the chaotic post-truth world sliding towards greater inequalities, rising racial tension and a failure to meet the demands of gender equality with a confident swagger of big beats, flawless flow and chilled vibes. The absolutely indispensable album of right now. Neneh Cherry tickets are currently available.